Using shade net fabrics will enable you as a grower, to modify or create an ideal protected micro climate, in which to produce high quality seedlings, fruit, vegetables, pot plants and cut flowers. Shade net will provide protection against calamities, providing an environment for optimum growth and yield. It ensures good air circulation, with excellent moisture exchange resulting in large savings in water and chemical sprays. The Shade Net lock-stich pattern, only obtainable through a knitted construction, means the fabric will not fray or unravel when cut. The mesh size governing the shade percentage is fixed or locked in place, making it impossible for it to be altered or manipulated. Due to its knitted lock-stitch pattern, this product allows easy joining and repairing should it be accidently torn. The external factors that influence the rate of photosynthesis are, to a degree, under the control of the plant grower. Modifying these factors can influence crop yields. The use of shade netting assists immensely in optimizing the photosynthetic response of plants and crops which is the fundamental process in determining any plant or crop’s yield, as well as offering the opportunity to manipulate some of the photo morphological responses associated with the quality of the produce. Plants and crops suffer from excessive heat, strong winds and UV burn, which generally results in smaller, lower quality yields. Hail, severe storms, insects and birds, can cause considerable damage to plants and crops. Light affects plants in two ways, namely, by providing the energy for the manufacture of sugars and starches (carbohydrates) and providing the signal that directs a plant’s morphological development. The growth of most plants is most efficiently driven by the absorption of the blue and red wavelengths from the light spectrum, by the chlorophyll and carotenoid pigments in the leaves of the plants. The relationship of blue and red light wavelengths absorbed by the plant’s leaves, will ultimately determine the effectiveness of the photosynthesis process as well as the photomorphological responses. The relationship between the various wavelengths of light (colours) can be manipulated or modified through the use of the wide range of shade netting which is manufactured in various colours and constructions (aperture sizes). The colour and construction range currently available is black, white, green, blue, photo red, apple blue, black/white, black/green, silver and a combination of these colours. Shade factors vary from 8 to 80 percent on certain products. Different plants have distinctly different light, water and nutrient requirements in order to produce the best crop. It is therefore important to establish the light requirements of the plants to be grown, which will depend on the geographical region and the light intensity available from the sun. 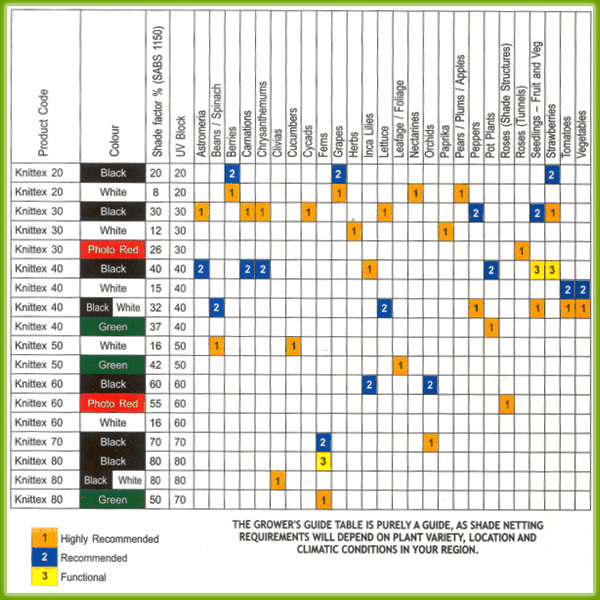 The Growers Guide table provided is purely a guide, as shade netting requirements will depend on plant variety, location and climatic conditions in various regions. 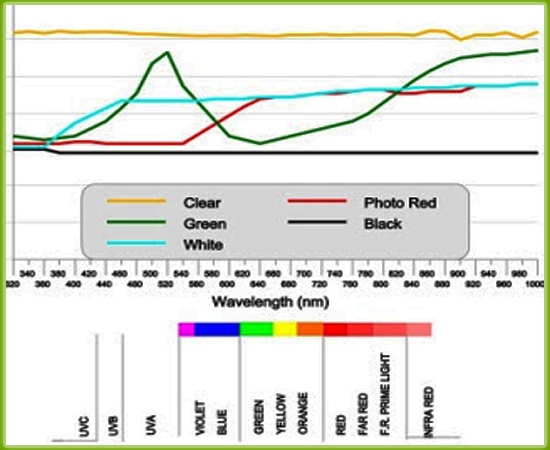 The light transmittance graph provided is one example and is indicative of how the light wavelength absorption levels and their respective relationships are modified by the use of shade netting in the same construction and in different colours.